FREEPORT GRAND BAHAMA, BAHAMAS – August 10, 2012 – Decision Sciences International Corporation, an advanced technology provider of security and detection systems, today announced the deployment of its first fully operational Multi-Mode Passive Detection System (MMPDS), an advanced scanning device capable of locating both unshielded to heavily shielded nuclear and radiological threats inside cargo containers. 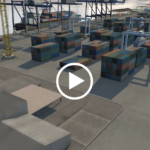 Decision Sciences demonstrated the operational system for security firms, shipping lines and government officials at the Freeport Container Port in the Bahamas. “Securing the world’s global supply chain is vital and there is no technology currently deployed that can both safely scan shielded and unshielded cargo for hidden radiological threats and do so without slowing the flow of activity at a busy port,” said Godfrey Smith, CEO at Freeport Container Port, a member of Hutchison Port Holdings (HPH), a subsidiary of Hutchison Whampoa Limited (HWL), the world’s leading port investor, developer and operator. Decision Sciences MMPDS, based on technology originally developed at the Los Alamos National Laboratory, is capable of scanning all types of cargo containers, vehicles and rail cars without impeding the flow of commerce and without generating harmful radiation. The MMPDS technology was introduced to the HPH group by its Senior Vice President Gary Gilbert. “Freeport Container Port’s geo-political location, its highly trained workforce, high transshipment traffic and commitment to high safety standards make it an ideal partner for this live demonstration and installation,” said Smith. Decision Sciences is an advanced security and detection systems company based in Chantilly, Virginia, that brings together hardware and software development, systems integration and cutting edge science to improve the safety and security of global commerce. Based on technology originally invented by scientists at the renowned Los Alamos National Laboratory, the Multi-Mode Passive Detection System was then developed with considerable private sector investment and expertise. MMPDS is a totally safe, effective and reliable automated scanning device for quickly detecting unshielded to heavily shielded nuclear and radiological threats. Critically, MMPDS satisfies the 100% scanning requirement recommended by the U.S. 9/11 Commission and later enacted into law by the U.S. Congress. Situated only 65 miles from Florida, Freeport Container Port (FCP) is the natural trans-shipment hub for the Eastern seaboard of the Americas and the principal East/West Line Haul routes through the region. FCP is a member of the Hutchison Port Holdings (HPH) Group. The HPH network of port operations comprises 315 berths in 52 ports, in 26 countries throughout Asia, the Middle East, Europe, the Americas and Australia. In 2012, the HPH port network handled a combined throughput of 75 million TEU (twenty-foot equivalent unit) worldwide and over the years, HPH has expanded internationally into other logistics and transportation-related industries such as cruise ship terminals, distribution centers, rail services, ship repair facilities, airports and hotel operations.